The Nigerian army has reacted to the alleged invasion of the residence of Nnamdi Kanu of the Indigenous People of Biafra by its men where five persons lost their lives. Report had it on Sunday that military men, who had stormed Kanu’s home with an armoured vehicle, were resisted by some members of the pro-Biafra group, killing five persons and injuring others. 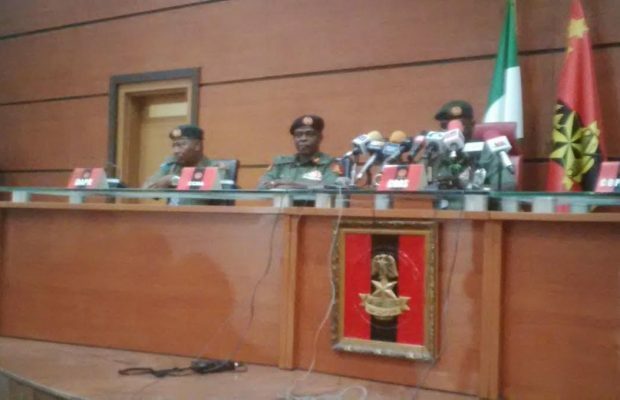 Reacting to the report via a statement obtained by DAILY POST Sunday night, Major Oyegoke Gbadamosi, Assistant Director Army Public Relations, 14 Brigade Nigerian Army, said Nigerian army officials were not behind the attack. “The attention of 14 Brigade Nigerian Army has been drawn to fictitious news going round especially on the social media that troops have invaded the home of Nnamdi Kanu and killed 3 persons. “This is far from the truth. Rather, it was a group of suspected IPOB militants that blocked the road against troops of 145 Battalion while on show of force along FMC-Word Bank Road in Umuahia town, Abia State at about 6.00-6.30pm, today. “The troops fired warning shots in the air and the hoodlooms dispersed. No life was lost. “Therefore, the public are kindly enjoined to disregard the rumours going round and the fictitious photographs of purported victims of attack. Both the soldier and the innocent female passerby have been evacuated to the unit’s Medical Inspection Room and are receiving treatment. 0 Response to "Biafra News Today: Army speaks on reported ‘invasion’ of Nnamdi Kanu’s house"